I used to have a butterfly phase. I still have a butterfly phase. 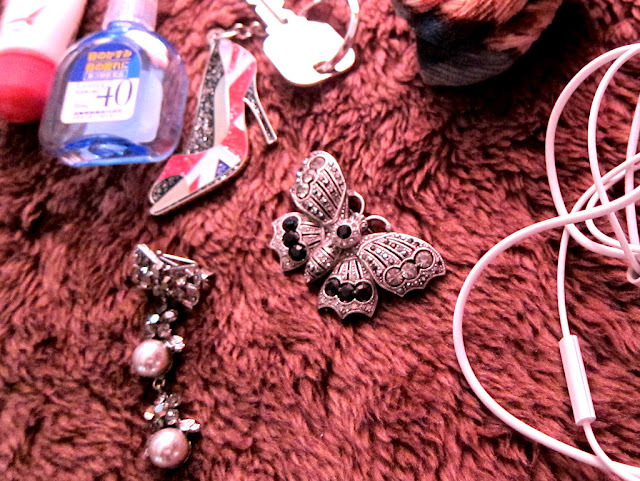 I can buy everything that has a butterfly on it; brooches, tops, necklaces pendant, bracelet..it's a massive obsession. And it's weird that a simple hair band can make a girl this happy. Despite the fact that no one can actually see me wearing this, I feel like the luckiest girl in the world. Since my shawls are taking a huge space in my poor wardrobe, I have to put it somewhere else - and I got this for only 315 yen! Found this store called 3coins in Hiroshima which sells everything (and I mean, everything) for prices as low as 300 yen. From kitchen supplies to home decor, you can buy so many things for a 1000 yen note. And the quality is superb for cheap stuffs, unlike 100 yen shop things. It's not hard to please me.